Mobile Computing is a human computer interaction through which the computer can transmit data with the help of voice and video via computer or any other wireless device without connecting to a fixed physical link. 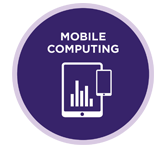 This tutorial will give a clear idea of Mobile Computing and it will take you through evolution of mobile computing and where is the technology headed to in future along with the classifications and security issues involved. This tutorial has been designed for the fresher’s and beginners to help them to know and learn the basics of Mobile Computing. It is a valuable resource for any beginner. After going through this tutorial, you will find yourself at a moderate level of expertise in Mobile Computing from where you can move yourself to the next level. This tutorial assumes the students of not knowing the basic concepts of Mobile Computing, but still you are living in the present where mobile phones, PDAs and Tablet PCs are being used in day-to-day life.